The White Road Hike is a short but stunning hike located in the town of Kamuela. The White Road Hike takes you through the Kohala Forest Preserve to the back of Waipio Valley. I find it difficult to describe the views of the hike but once you get there, the views will leave you speechless. I took a recent trip to where I grew up on The Big Island of Hawaii. When I was a teenager, I often remember my brother telling me about an amazing hike that went through to the back of a popular valley called, Waipio. This hike is known as The White Road Hike. In recent years, social media outlets have increased the popularity of this hike. Largely in part due to the fact that a portion of this hike is constructed along the old Kohala Ditch System. The ditch system was used to carry collected rain water through the mountains to where it could be used for the old sugar cane plantations that covered the north east side of the island. Along this ditch is a famous flume that carries water down to a next portion of the ditch system. This flume has a large concrete square pool at the bottom of it several feet deep. The flume is used by many as a water slide to go down for leisure. Do note, that attempting to do this carries with it certain risks of bodily harm or injury. Weather is the biggest difficulty when trying to catch the views that The White Road Hike has to offer. 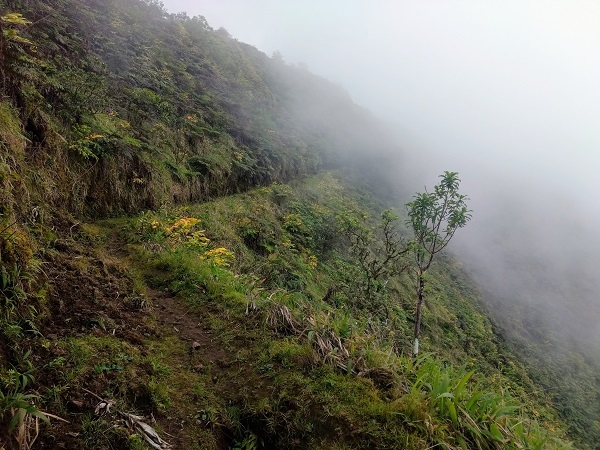 The hike lies in the perfect spot where the dominant trade winds blow in clouds causing incredibly dense fog with low visibility. Rain is common and can be anywhere from a light drizzle to a steady downpour with intense thunderstorms. The views across the valley are often obscured by thick dense fog and accompanied by rain. Luckily, the skies were mostly sunny when starting out. To get to the valley overlook is about 1.7 miles or so. Once there, the trail takes an approximate 90 degree turn to the left and there are three optionsL stop and turn around, continue to the infamous ditch water slide and turn around, or backpack it through the Kohala Forest Preserve. I didn’t go much further than the valley overlook but the views I saw from there were incredible. From the valley overlook a deep valley lies below your feet dropping off over 1,500 feet. A vertical cliff of the mountain rises nearly a couple of thousand feet with several waterfalls on the other side. Any clouds will obstruct this view but on this day I was lucky enough to catch the view before some thick fog rolled in. Before going on any hike, it’s always a good idea to asses what level of hiker you are. The few hundred yards or so of the hike are on private property. I am in no way endorsing that you hike this and if you do so, you’re acknowledging that you’re going through private property and doing so on your own accord and at your own risk. The Department of Land and Natural Resources will give you a permit to hike through the Kohala Forest Reserve only if you can show in writing that it is okay to cross the private property portion. Also, the cliffs along the trail through the Kohala Forest Preserve can be muddy and slippery. Going through this portion can put you at risk of sliding down several hundred feet and risking bodily injury or death. Bodily injury of life threatening harm can also occur from sliding down the Kohala Ditch Slide. PreviousA Guide To Hiking Skill Levels – What Type Of Hiker Are You?